Ben Winyard, Digital Publications Officer at Birkbeck, discusses Stage One of our online redesign. 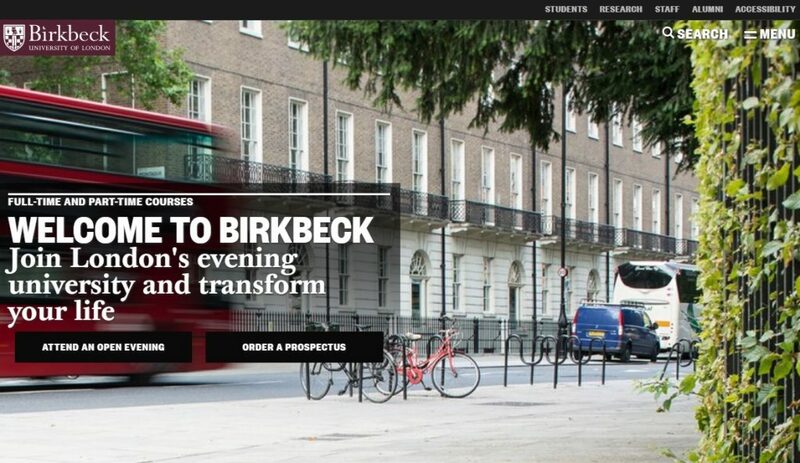 Stage one of Birkbeck’s ambitious Digital Transformation Project went live on 16 May 2017, with the launch of a bold new design and layout for our homepage, corporate site and online prospectus. Since then, External Relations and the ITS Web Team have busily continued with improvements that, while less dramatic in terms of immediate, aesthetic impact, are just as important for bettering the user experience, optimising the accessibility of our website for all users, and making sure visitors can get the information they want quickly and easily. A core principle of the Digital Transformation Project is that our decisions should be evidence-based and user-focused. In pursuit of this goal, we regularly test users’ responses to our website. Since February 2017, we have run around 50 user testing sessions, which covered the pre-launch, launch and post-launch phases of stage one. Some initial changes we made as a result of user feedback were adjustments to styling and making information clearer and easier to find. During the June user testing sessions, we looked at how users search for courses and judge their quality, using Google, UCAS, and other comparison and rating sites. As a result, we implemented improvements to usability on our online prospectus, including: rewording and redesigning buttons and signposts; adding links to other available years of entry and to other versions of the same course (‘Related courses’); retitling fields to make browsing easier; and adding career destinations information (pulled from Unistats) to all of our full-time undergraduate courses. As well as identifying usability issues, regular user testing is also increasing our understanding of how people use our website, which informs future developments. This feedback is proving vital for the next part of the Digital Transformation Project, which is focused on improving our site and course search. We know that the majority of our visitors come to us via Google. But we have learned that an increasing number of visitors – especially younger users – primarily navigate our site via internal course and site search, or externally through Google, rather than using our menus. This makes it even more pressing to ensure our search facility is the best it can be, which is one of our primary aims for the immediate future. User testing sessions in August concentrated on course and site search; they confirmed that improvement is needed and provided vital information on how users expect a search facility to work on a university website. We are also looking at how students use school/department content on the Birkbeck website and how this content fits into the user journey. This is with a view to launching a project to bring our school/department content into the new visual identity and web design, which will also include rationalising and improving content and navigation, in order to enhance the user experience and ensure all of our users can find the information they need. In External Relations, our focus so far has been on improving our online prospectus, the most visited and the most important part of our entire website. Depending on the time of year, our online prospectus can total well over 4000 pages, each with its own unique content and each playing a vital role in telling prospective students about Birkbeck and encouraging them to apply. Improving our online prospectus has two strands: rewriting descriptive text for our courses and improving all of the modules that are currently available for undergraduate and postgraduate students. In both instances, we have been applying our new house style and polishing content to make our course and module descriptions accurate and engaging. 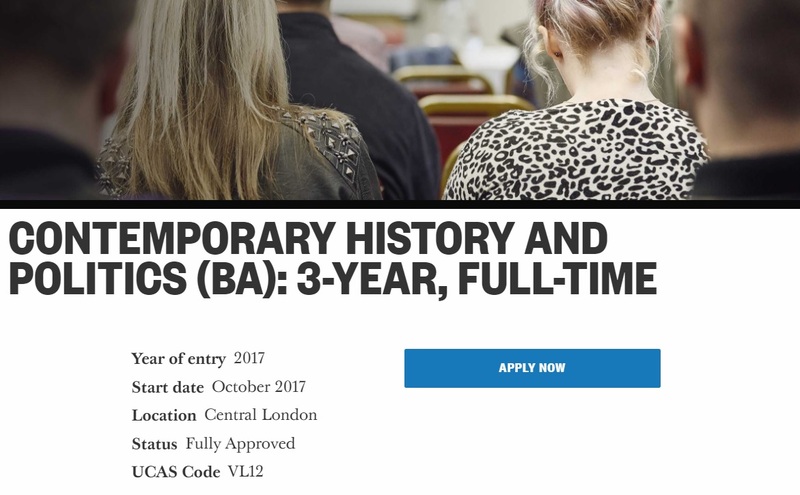 Our primary aim with any online course description is to grab the reader’s attention and let them know about what is unique, interesting and exciting about the course and about Birkbeck. An example of a programme page in our new design. On our programme pages, we have focused attention on the overview, highlights and course structure fields. We know from heat maps and analytics that these are the most visited parts of every programme page, so we wanted to dedicate time and attention to making this text really sing. It’s important to us that we do justice to the intellectually stimulating content of our courses, to the dedicated, world-leading academics who teach them, and to the life-changing opportunities offered by Birkbeck’s unique model of evening study. We have also been working hard with colleagues to ensure our online course pages are compliant with new legal requirements from the Competition and Markets Authority (CMA). These changes will increase the usefulness of our online prospectus by presenting important information on student contact hours, independent learning, learning development and support, and how students are taught and assessed across Birkbeck. Our module improvement project has one primary focus: ensuring that every available module at Birkbeck is part of our online prospectus and includes rich, appealingly written descriptive text that adheres to our new house style. We have been working closely with our colleagues across Birkbeck’s five schools to source content and have updated and improved around 200 modules so far. So, what difference has our redesign made, in terms of the number and quality of visits? An important measure of improvement and quality is the increased amount of time people are spending on our site; visitors spend longer engaging with the improved content and are finding it easier to navigate between different areas. There has also been an increase in the number of returning visitors, so we know that people are coming back to us. Our online prospectus remains the focus of most visitors’ attention and continues to attract the highest interest. User testing and analytics reveal that, for many visitors, our course pages are their first interaction with Birkbeck, so one of our primary aims with the new web design has been to convert each of our online course pages into a ‘mini-homepage’, with links to news, events and research across Birkbeck and to vital information, such as financial support, student services and accommodation. To this end, we added tertiary signposts to every programme page and we are now seeing that people use our course pages as their main entry route into, and the jumping-off point to, other parts of the Birkbeck website. Other parts of our site have been dramatically upgraded: there are far fewer pages and we have consolidated information in one place and converted old information into downloadable documents, where appropriate. This has led to a significant increase in engagement: visitors are now spending more time on these pages and going through the information more thoroughly, because it’s all in one place and easily navigable. Meanwhile, we have instituted a regular weekly maintenance slot, during which three web editors in External Relations make requested changes to all areas of our new site. Since May, we have implemented hundreds of such requests, all with the purpose of improving the accuracy and helpfulness of our content. We have also developed an entirely new Digital Standards area on our website, which provides advice, information and support to all Birkbeck staff who need to convey information online. You can read our house style guide, find out about search engine optimisation, get practical information on links, files and redirects, and learn more about our visual identity and our social media guidelines. We are working hard to supplement this online support with bespoke face-to-face training, which we are in the process of developing. We have also begun using new software that identifies accessibility, content and coding issues across our site, which is greatly helping us continually maintain and improve the new site. We have a series of ‘conversion goals’ on our website, whereby a user’s visit is translated into an action. We primarily want visitors to: order a prospectus; or book an Open Evening; or submit an application to study. We have seen a dramatic increase in these since we launched the new website, so it is pleasing to see that our work continues to support and advance the primary objectives of the Digital Transformation Project. Category: Arts, Business Economics and Informatics, Law, Science, Social Sciences History and Philosophy Tags: birkbeck, branding, digital, prospectus, redesign, style, university, web, website by Louisa. Great to read about the ongoing work, Ben. Keep up the good work!